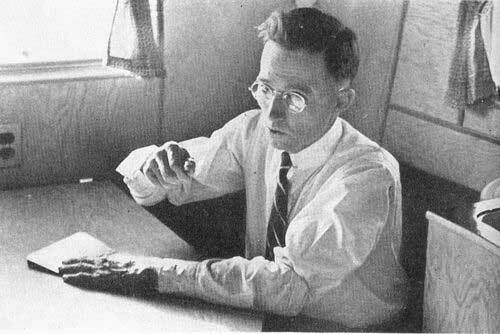 In the 1920’s Harvey Nininger was a professor at McPherson College teaching biology but he also taught a course in geology. In the middle of August 1923 he had read an article in the Scientific Monthly by a professor A. M. Miller from the University of Kentucky on the subject of meteorites which intrigued him. All during his college years he had maybe only heard of the field of meteorites discussed but about once. He had visited the Field Museum in Chicago seeing the display of meteorites there and ponder how they could know for sure these were from out side our planets confines. He thought here was a source of information that could yield great clues about the solar system and beyond. At that time astronomers were making no special effort to use this information and the same could be said for geologists except for the random falls and finds that were thrown into their laps for study. On the evening of November 9th 1923 at McPherson, faculty and students gather at a chapel for a lecture or other event. At the end of this event Nininger and fellow professor E.L. Craik walked towards Craik’s house and were chatting. A sudden blazing stream of fire illuminated the sky lighting up the surrounding landscape and vanished with an equal suddenness. An event that started Nininger on his crusade to find out more about the rare events and launched his effort to unravel those mysteries the rest of his life.